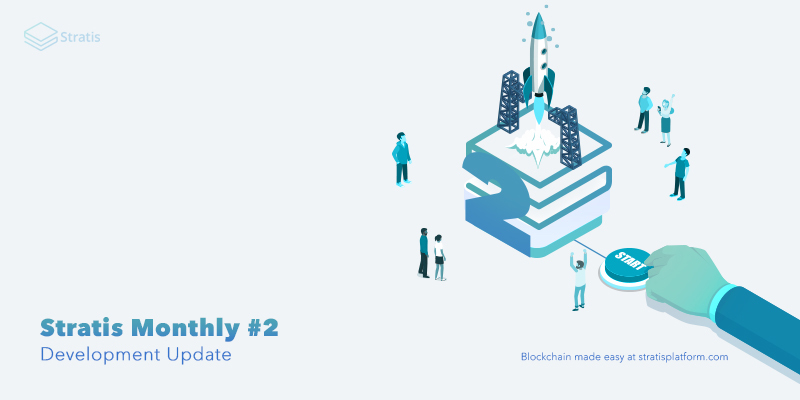 Another month has passed since our initial monthly update. This month the focus has primarily revolved around the development of the Sidechain Masternode. During the month of March, the Stratis Full Node team has delivered 2 releases. A total of 124 Pull Requests were merged into the codebase during this period. Development for the most part continued to focus on stability and performance of the Full Node. In addition, attention has been drawn to RPC capabilities to ensure readiness of exchanges transitioning to the Full Node. This is a crucial step in moving to a network secured entirely by the Stratis Full Node. The latest version of the Stratis Core wallet contains the 3.0.3 version of the Full Node and can be obtained from our wallets page below. The development of Masternode features is nearing completion, including key developments to greatly improve the end-user experience. 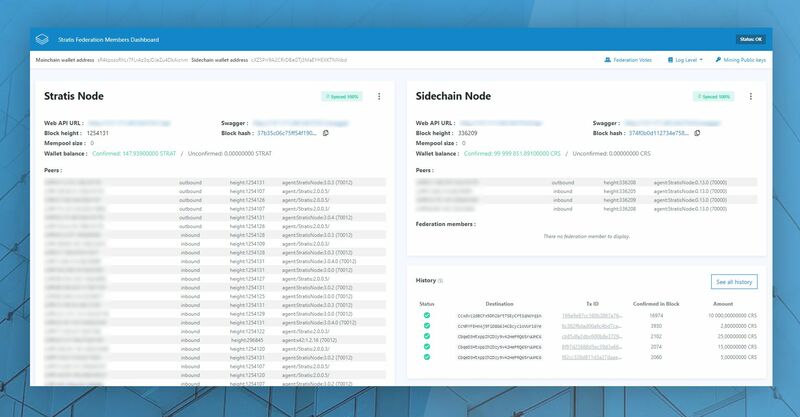 A preview of the Sidechain Dashboard can be found below, the dashboard will be used to monitor and manage the Sidechain Masternode. As mentioned in our community Discord last week, we are actively developing a Privacy Protocol solution for STRAT. The further development of the Privacy Protocol will include a new version of the Breeze Wallet with enhanced security. In addition, we are working on bringing Segregated Witness support to the Stratis network to enable native Privacy Protocol support. These are exciting developments that will bring further utility to the Stratis Token, offering the ability to improve the level of privacy with the STRAT token. 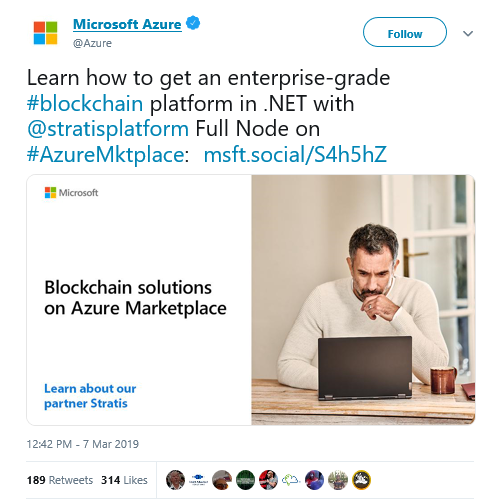 As a result of our relationship with Microsoft we received a Tweet from the Microsoft Azure twitter account highlighting the Stratis Full Node’s availablility on the Azure Marketplace. 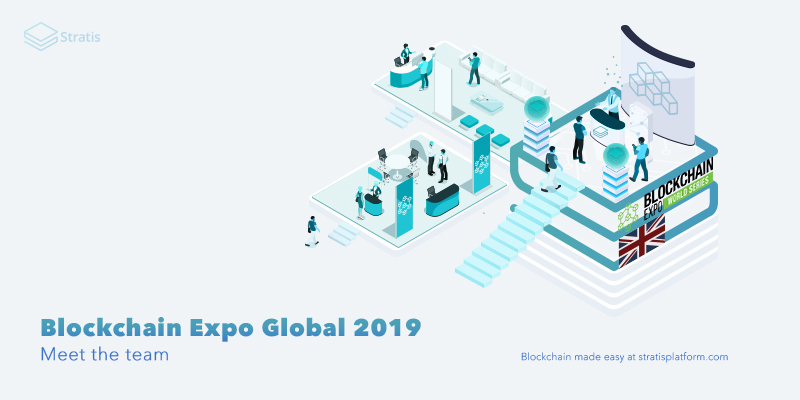 In less than four weeks, the Blockchain Expo Global 2019 will kick off. It’s an exciting time for us particularly as we will be arriving with several innovations under our belt. The Blockchain Expo Global is all about showcasing where blockchain is heading, and we have speakers scheduled to talk about two key Stratis technologies: Smart Contracts and DLT. Stratis is once again a Platinum Sponsor for this event and will be showcasing our newly designed booth and can be found on stand 461.